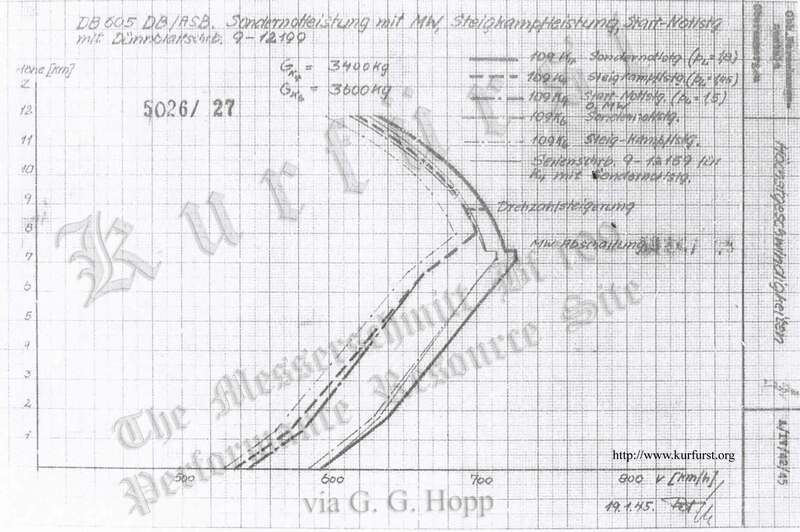 This report prepeared by the Messerschmitt Projektbüro in December 1944 contains calculated effects on performance expected from new type propeller (VDM 9-12199), which differed in its thinner blades from the serial production VDM 9-12159, that was fitted to late war Bf 109s with high-altitude DB 605AS or D engines. 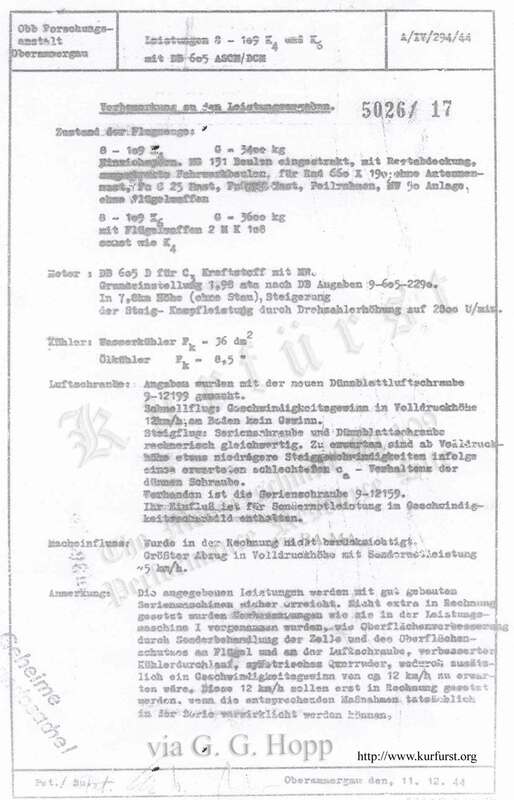 Altough it is believed the so-called Dünnblattschraube VDM 9-12199 was not standardized, this report is of special interest it also shows - as a reference - the performance of the serial production Bf 109K-4 with standard VDM 9-12159 propeller and as such it is a valuable resource for the basic performance figures of this last, potent subtype, at it`s numerous combinations of the engines, manifold pressures and MW-50 boost used. 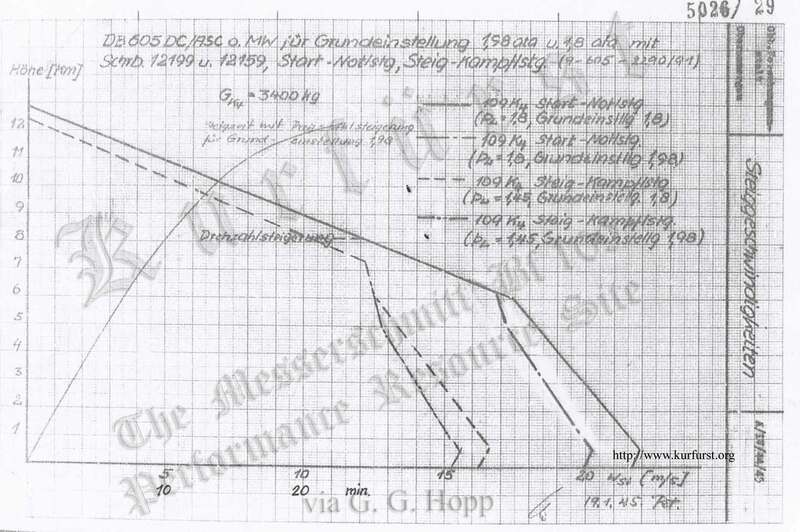 Actual flight test trials with the VDM 9-12199 Dünnblattschraube, as well as various other propellors of advanced design were also performed at Aspera Gmbh., showing improvements in good agreement with the Messerschmitt Projektbüro report. 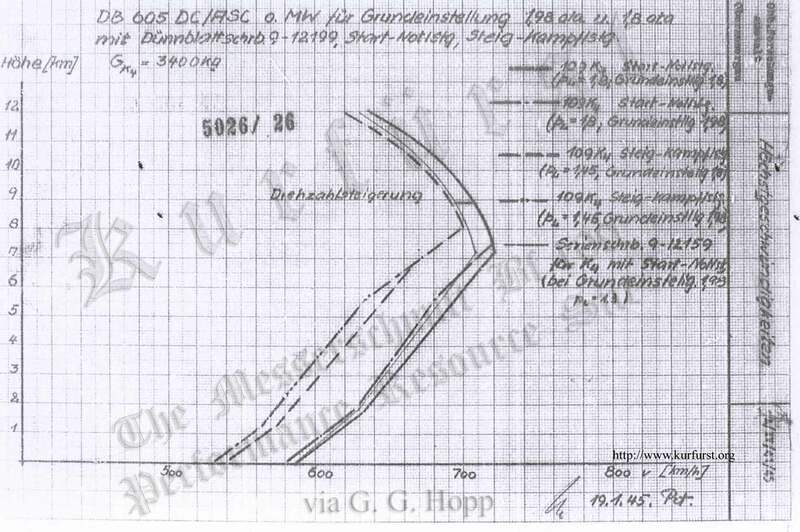 The calculations show performance of the Messerschmitt 109K-4 with the DB 605DB/DB engines. Further information is available on these details can be at the appropriate links; it should be also noted that the DB 605 DB and DB 605 DC designations are referring to the same engine, set for different maximum manifold pressure and fuel type; converting DBs into DCs or DCs into DBs was a simple matter. As this powerplant had numerous variations in settings, it is worthwhile to briefly overview their representative outputs at the settings referred by level speed and climb rate graphs of the Projektbüro report. DB 605 DB, when set to base setting ('Grundeinstellung') 1,80 ata. Either B-4 fuel with MW-50 injection, or C-3 fuel without MW-50 injection. Actual manifold pressure being 1,80 ata Sondernotleistung, with MW-50 injection: 1850 PS output at SL, 1600 PS output at 6,0 km. Actual manifold pressure being 1,45 ata Kampfleistung, without MW-50 injection: 1430 PS output at SL, 1285 PS output at 6,8 km. DB 605 DC, when set to base setting ('Grundeinstellung') 1,80 ata. Possible without MW-50 injection. Actual manifold pressure being 1,80 ata Sondernotleistung, without MW-50 injection: 1800 PS output at SL, 1550 PS output at 6,0 km. DB 605 DC, when set to base setting ('Grundeinstellung') 1,98 ata. Only with C-3 fuel. Actual manifold pressure being 1,98 ata Sondernotleistung, with MW-50 injection: 2000 PS output at SL, 1800 PS output at 4,9 km. Actual manifold pressure being 1,80 ata Startleistung, without MW-50 injection: 1725 PS output at SL, 1550 PS output at 6,0 km. Actual manifold pressure being 1,45 ata Kampfleistung, without MW-50 injection: 1370 PS output at SL, 1285 PS output at 6,8 km. 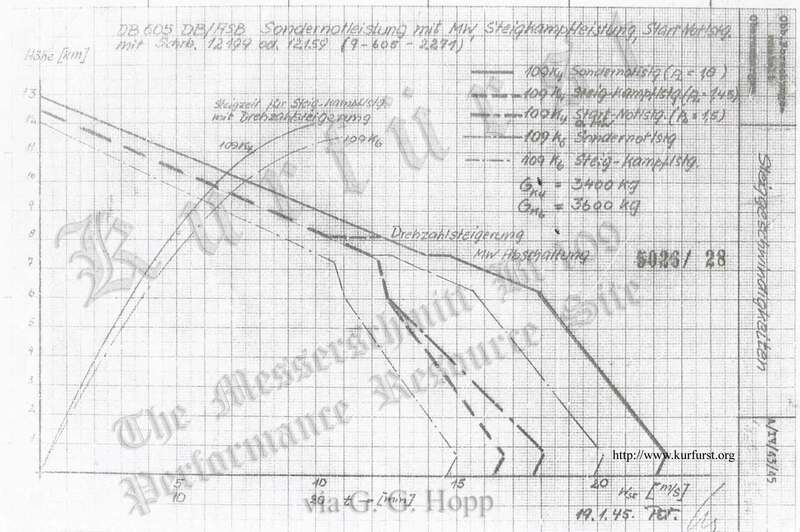 It should be noted above the Volldruckhöhe, the calculated graphs that MW-50 injection is shut off (MW Abschaltung), resulting some drop-off in output in the range of apprx. 50 PS, as MW-50 delivered apprx. 4% increase in engine output when used even at the same manifold pressure, due to its charge cooling properties. 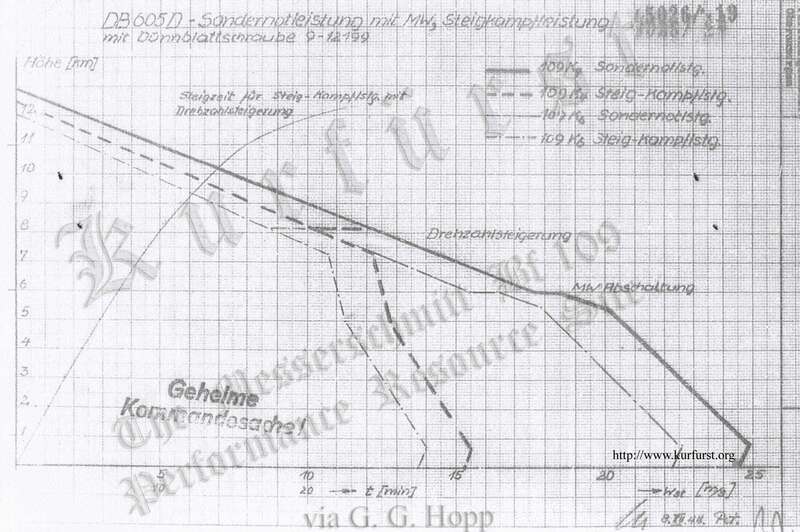 German operating manuals suggest switching off MW-50 injection above the rated altitude of the engine, because of wasteful nature of operating a boosting system when it it no longer effective, however the system was manually operated by and at the pilot. Special thanks is due to Mr. G. G. Hopp who did the original research, and kindly made the documentation available for the rest of us. Transcription and translation by Kurfürst. Special thanks to Herr Henning Ruch for revealing the meaning of some very special technical terms (ein/ausgestrakt) for me, and for the corrections suggested. Preface for the performance data. Engine : DB 605 D for C-3 fuel with MW. Basic setting 1.98 ata after DB instruction 9-605-2290.
the Steig- Kampfleistung by increasing the revolutions to 2800/min. Oil cooler Fk = 8.5 "
no gain at Sea Level. expected worser Ca - behaviour of the thin bladed propeller. Standardized is the serial propellor 9-12159. 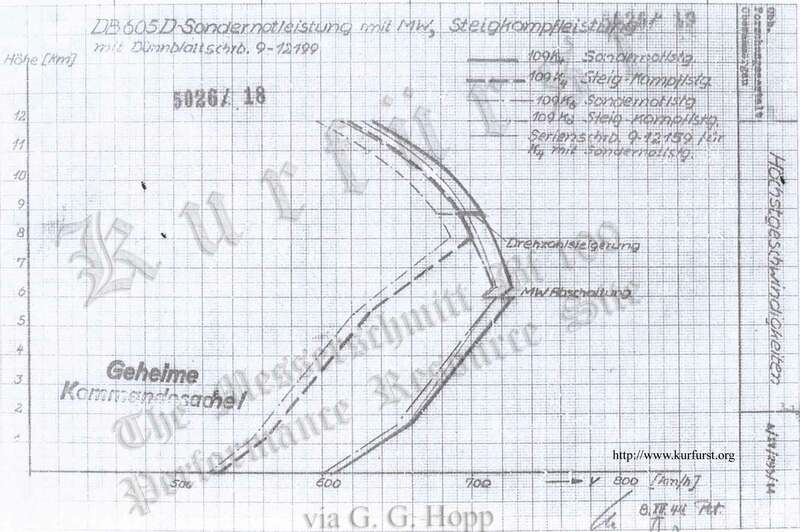 It's effects on Sondernotleistung are shown on the speed graphs. Mach : Were not taken into account in the calculation. Pet./Bu. [signed] Oberammergau, on the 11 December 1944. 5026 /17 : 'Leistungen 8-109K4 und K6 mit DB 605 ASCM/DCM.' (original German scan of the translation above).